As of late, there has been a surge in conversation around the topic of the college-going population here in the United States. One one hand, we have long talked about the “The Perfect Storm” of demographics. For example, here is a simple Google Search. On the other, the decline in college enrollment, has been connected to changes in the labor market. In the end, it might be nice to review what data exist and highlight how these flashy headlines could have been predictable well in advance of 2014. 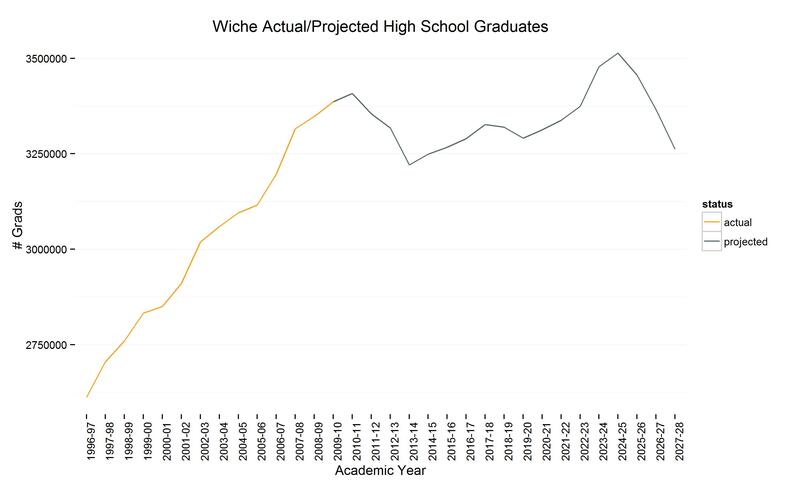 For this post, I will be using using the R language to download the data from WICHE, an amazing resource for projections of High School graduates by state. Using these data, we can do all sorts of fun analyses. In a future post, I will show you how to link WICHE to IPEDS data in order to forecast college participation rates by state. While I will provide a few code snippets below, you should feel free to clone my Github Repo which everything you need to replicate this post. Also included is a Tableau Workbook. If you have Tableau Desktop, this super basic workbook highlights how you can leverage parameters to create your own forecasts. Below is a screenshot of the workbook, which is a basic “Create-Your-Own College Enrollment Forecast” of sorts. For those of you that might be new to R, reading code can be extremely helpful when attempting to learn a new language. When possible, I always try to comment the heck of out my code. Hopefully these comments can help you in your journey. With R, it’s super simple to grab data from the web. The command below will download the WICHE Excel Workbook. Now we can use the RODBC package (on Windows) to connect to the workbook and query it as if the sheets were database tables. Because each state is a tab in the workbook, let’s use R to define an object that holds the state abbreivations, which we will use while looping through the workbook. ## how cool is it that R has the State names and Abbreviations preloaded? When playing around with data, it’s usually a good practice to visualize what you have. Below is a quick plot which represents both the actual and forecasted volume of high school graduates going until the 2027⁄28 Academic year. I would encourage the reader to browse the code, and if possible, fire up the Tableau workbook. As an Enrollment Scientist, R and Tableau are my two tools that I use on a daily basis.